This is very high quality RAM, worked great with my ASUS x79 pro MB, no installation problems. The Mod utility is great. Very well priced. 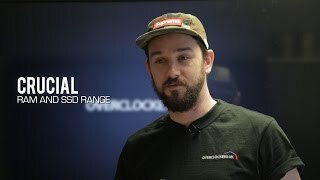 Excellent service from overclockers. Just a heads up on this ram. 1st of all, my 8GB kit is running at 2133, not kidding. Second there are 2 sets of LEDs. The first set is always on and glow onto the motherboard from the bottom of the sticks. The second row is at the top. Both of these strips can be either colour. So, I have to say that I am in awe of these, they preform and clock stupendously well, and, ofc, they look the buisness. Amazing ram. I have had it running for about a week now. Cant beleive you can get 16GB of ram (bought 2 kits) of this quality for this price. Hugely over clock-able aswell. Plus the MOD utility is awesome!